Quick Recap: Sparklines are mini charts drawn in a single cell based upon data from multiple cells. It is an easy yet effective way of comparing data. 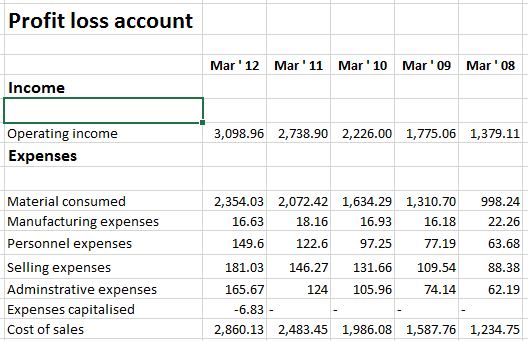 Typical financial statements show data in reverse order. Current year first followed by past years. You have to read each number from right to left and then compare them mentally to form a pattern. Then we read each row and try to correlate it with other rows. Now see the same data with Sparklines. Look at the Operating Income. At the first glance it looks as though it is decreasing over time. But in reality, it is increasing over time – data is in reverse order. Axis options – Plot from right to left. Problem solved. Any kind of comparison can be performed visually using Sparklines as long as the data is numeric. Notice how it helps you see a clear difference across the models without reading the numbers. It highlights the winner clearly and without ambiguity. How does it happen? Because it takes the minimum value across the row as the beginning of the axis. Usually all bar charts start with zero. However in this case, the Power bar chart is starting at 177. Therefore the smaller value becomes visually insignificant. Due to this visual contrast, it is easier to interpret the information. Of course, remember that this may lead you to underestimate actual values. If you want true to life representation of proportions, traditional charts are better.